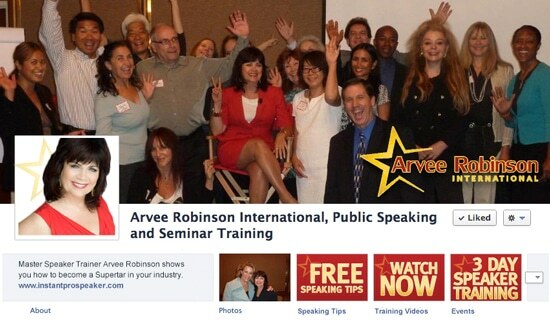 Arvee is a public speaker trainer who had exceeded her personal friends Facebook limit and needed to direct new friends to her fan page. She wanted a look that was powerful, professional, unique and fun and that communicated her company’s brand which creates superstars. The problem she needed to solve was that fans were finding her personal profile and not her fan page. Then they would friend request her but she couldn’t accept them because she had too many. This is a problem many people face when dealing with both a personal profile and a fan page using your name. Arvee asked me if I could help solve this and we came up with a solution to put text right on the personal timeline image giving instructions to visitors for what to do. I also encouraged her to personally respond to all requests with a private message that directed fans to her fan page. In addition to solving this problem, Arvee wanted to have her fan page properly set up so it was more accessible and searchable for new potential fans. As for the personal page the image was replaced with a newly designed image that reflected her company’s branding and it included the instructions to direct fans to the fan page. 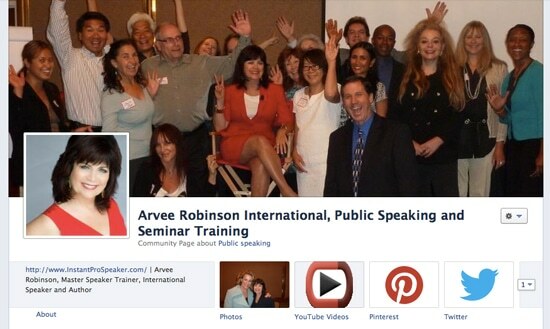 Arvee came up with a great way to communicate what she wanted visitors to do without alienating them. And it has been effective at getting new fans over to her fan page. What challenges have you had with your facebook page? Find out if we can help you too.